The Stitzel Distillery supplied much of the whiskey sold by the Weller wholesale firm. The consolidation coincided with prohibition during which time the Stitzel-Weller firm was licensed by the government to produce whiskey for medicinal purposes. One of their labels that was introduced on the market just before prohibition was Old Rip Van Winkle. After prohibition, the brand was not reintroduced until after 1972 when the Stitzel-Weller distillery and its current brand names (including W.L. Weller, Old Fitzgerald, Rebel Yell, and Cabin Still) were sold to other companies. The only brand name to which the Van Winkle family kept the rights was the pre-prohibition brand Old Rip Van Winkle. The Stitzel-Weller plant was opened on the day of the Kentucky Derby in 1935, just outside Louisville in Shively, Kentucky. 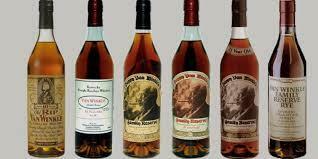 At the time of his death in 1965 at the age of 89, Pappy Van Winkle was the oldest active distiller in the nation. A photo of him graces the bottle's label. Sometime after the Stitzel-Weller distillery was sold in 1972, Julian Van Winkle, Jr. resurrected the pre-prohibition Old Rip Van Winkle brand and initially used old whiskey stocks from the distillery for its bottlings. Julian Jr. died in 1981 and Julian Van Winkle, III (Pappy's grandson) took over the Old Rip Van Winkle Distillery company. After the initial sale in 1972, the Stitzel-Weller distillery was eventually closed completely in 1991] In 1984, Buffalo Trace distillery commercially marketed the first modern (post-1950s) brand of single-barrel bourbon, Blanton's. Since 2002, the Van Winkle brands have been distilled and bottled by the Sazerac Company at the Buffalo Trace Distillery as a joint venture with the Old Rip Van Winkle Distillery company. In 2013, Julian Preston Van Winkle III, said the 2013 bottlings of the 23-year brand expression "may be the last of its kind", since at that point there was very little left of the aging stock from the Stitzel-Weller distillery (although he said the brand would not be discontinued)] The makers say that they do not want to boost production, as there is considerable long term risk, and they do not want to be left holding copious quantities of unsaleable bourbon should tastes, fashions or circumstances change.